Hi! I was just thinking about all the things I’ve accomplished this week, at least in terms of crocheting stuff, and all the things I still have left to do. Then, I added in the fact that it’s only Tuesday and I was just blown away. I was lucky enough to be visited by my models, a friend of mine’s kids, on Sunday and we got some really adorable pictures, which I spent the evening editing. Then I updated the photos on Stella Hat pattern (use the code “Facebook” to get 60% off this pattern), released the Jackie Pillbox Pattern (with adorable photos, this pattern is 50% off right now no code needed), and added some shots to the forthcoming Ariel Boot Cuffs pattern (being tested right now). Then, on Monday I sent out some crochet items for a secret thing I can’t tell you about yet, and finished 2 patterns, also can’t talk about, and then started working on my possible submission to Happily Hooked Magazine. Quick question, anything specific YOU would like to see from me in preparation for the holiday/ gifting season (let me know in the comments)? 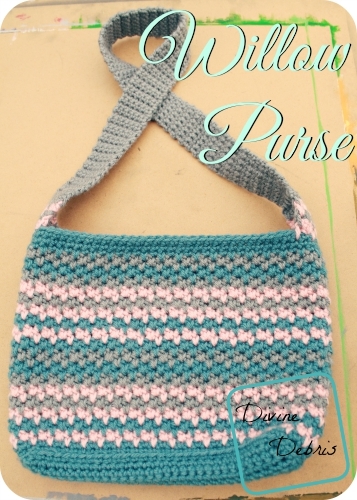 Anyway, like a month or more ago I got the idea for the Willow Purse, it was around the time I released the Diana Purse, and I never found the time to write up the pattern, even if I did complete the project in one night. 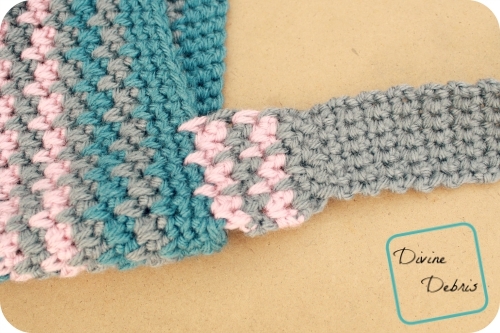 It’s a quick and really easy pattern, which I think you’ll like, that you can really customize to your liking. I’m going to be making it smaller so I can gift a child size to my little model, as she was bribed to sit for pictures and I must make good on the promise (even if she forgets, I (almost always) pay my debts). The sc/ spike sc combo of this bag makes it really thick and might not even need a lining, if you’re one of those people who can sew (I am not) and would think of adding one. You can purchase an ad-free downloadable pdf in my Ravelry shop. 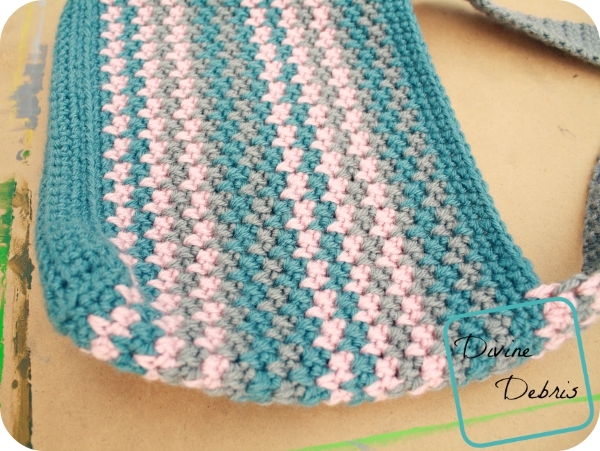 You will need to know how to work into the back loop only for a row of this pattern. Rotate on row 7 means rotate the whole piece 90°. Colors are labeled color A (dusty blue), color B (pink), and color C (silver grey). Fasten off all your colors, weave in your ends. Fasten off, leave a very long tail, which you will use to secure the other side of the strap. Switch to the other side (parallel to side 1). Line up your first st with the corner of your 6 sc side (refer to row 7 if you’re confused). Use the tail from this side and the tail from side 1’s row 122, to secure side 2’s row 8 to side 1’s row 122. Make sure it’s good and secure before weaving your ends complete. You can definitely adjust as you would like, making the bag bigger or smaller at your discretion, or making the straps bigger or smaller. I think when I make this for a little I’m gonna put a button closure, for fun. I’ll post pictures if I decide to do this. In closing, I really hope you enjoy this pattern and post photos of your finished projects on Ravlery or IG (with the hashtag #DivineDebris), and you never know I just might share the photo! Also, I released my Avery Hooded Cowl pattern (on the right) last week and it’s currently on sale for 50% off it’s regular price! This pattern was shared on Linky Ladies’s Community Link Party #12, OombawkaDesign’s Link and Share Wednesday #105, Creative Spark Link Party #67, and GS Heller’s Yarn Along. Lovely! Have you tried wine carry bags? they make great gifts, especially with a bottle in them! Love the bag 🙂 Thanks for the tutorial.